Free Photo and video tutorial will help you learn how to crochet 3D Edging. My Ellej’s 3D Flower flower is made in a similar way. Crochet by Ellej - Free Crochet Patterns and Tutorials. My name is Elena Kozhukhar and I’m glad that you looked into the creative treasury of my crocheting lessons! My free Crochet Tutorials will help you to understand the continuous crochet motifs, with delicate and dense stitch patterns, and, I hope, will be a source of inspiration for creating your own crochet masterpieces. The pattern for the dress is simpler the better. All attention was planned to concentrate on lace. Two buttons on the back of the dress. Free Crochet Tutorial. The combination of Puff Stitches, fans and intricate elements makes this pattern incredibly beautiful. 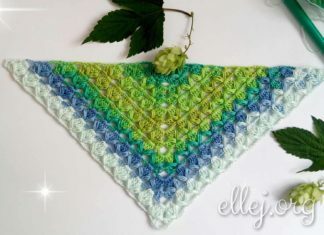 It suitable for working sleeveless, cardigans or gentle baby blankets ♦ Free step-by-step crochet photo Tutorial & Chart. The pattern of insanely beautiful, especially if you pick up the sparkle yarn for it ♦ Free step-by-step crochet photo Tutorial & Chart. Free Crochet Tutorial. I simplified the pattern for the shawl. This is make the shawl easier. The pattern is voracious and the product may be heavy weight.